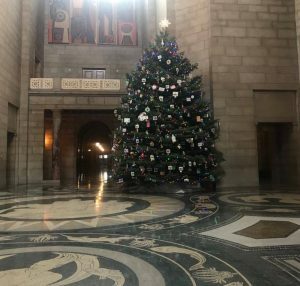 The Nebraska Legislature has been in full swing as the session winds down. With eight days left in the 105th Legislature, Second Session, before we adjourn sine die on April 18th, there is still much to be done and many bills still left to be debated. We have been working “late nights” lately, an opportunity to work into the evening and accomplish more in our short time left. To congratulate Nebraska Wesleyan University men’s basketball team on winning the 2018 NCAA Division III Championship, I introduced LR 367. 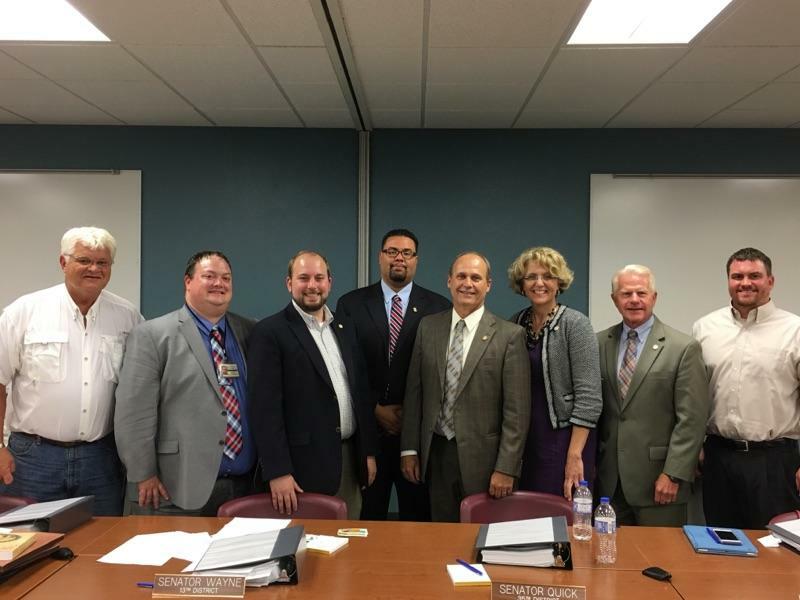 Senator Bolz, Senator Hilkemann, and Senator Howard co-signed LR367. Congratulations to the Prairie Wolves! As the interim approaches, senators have introduced interim study resolutions stating their intent and authorizing committees to perform an interim study on a particular topic or question. Interim studies allow us to dive deeply into topics during the interim, and determine effective policy solutions to potentially introduce as bills during the next legislative session. This year, I have introduced six interim study resolutions. LR370 is an interim study to conduct a review of issues arising from the lack of mental health treatment for those in the criminal justice system. LR391 is an interim study to examine the effects on elections should Nebraska switch to an all vote-by-mail system. LR392 is an interim study to examine neighborhood issues and potential neighborhood improvement tools. LR415 is an interim study to examine the effectiveness of current law as it relates to the imposition of bail and the requiring of money bonds for misdemeanors and city ordinance violations. LR432 is an interim study to examine issues faced by renters in Nebraska including rental deposits and fees, recourse for renters when rights are violated, and other issues. LR433 is an interim study to evaluate the availability of affordable housing in Nebraska municipalities with an emphasis on rental housing. February was a busy month, consisting of morning debate and afternoon committee hearings. Committee hearings ended yesterday, on February 27th, and starting today we will have debate on the floor in the morning and the afternoon until we adjourn in mid-April. Priority bills have been selected, as well. Each senator gets to prioritize one bill, each committee two bills, and the Speaker can prioritize 25 bills. Bills without a priority designation are unlikely to be heard on the floor of the Legislature this year. This month, the Legislature passed LB 146 and LB 93 on final reading. The Governor signed both bills into law on February 14th. LB146 will allow anyone guilty of an infraction to petition the court to set aside the conviction after paying the requisite fine or completing the assigned probation. Prior to LB 146, this was only allowed for misdemeanors and felonies. I appreciate the work of the University of Nebraska-Lincoln College of Law Civil Clinic students and faculty who identified the problem and worked with us on the bill. The Legislature also passed LB 93 this month. LB 93 will adopt the Automatic License Plate Reader Privacy Act. You can read more about LB 93 in the Unicameral Update article, here. I appreciate the help of my fellow state senators in passing these important pieces of legislation this session. This year, I have selected LB 986 as my personal priority bill. I introduced LB 986, which would authorize Neighborhood Improvement Districts (NIDs) in Nebraska. Based on successful Business Improvement Districts, NIDs would provide another tool for neighborhood improvement in Lincoln. You can read more about LB 986 in the Unicameral Update article, here. I am excited about all of the possibilities NIDs provide, and hope to advance LB 986 this session. This month, we held hearings on our remaining bills: LB 1056, LB 986, LB 1083, LB 930, LB 1029 and LB 1010. For more information on LB 930, see the Unicameral Update article here; and an article on LB 1056 here. Thank you to all who came out to testify on these bills. 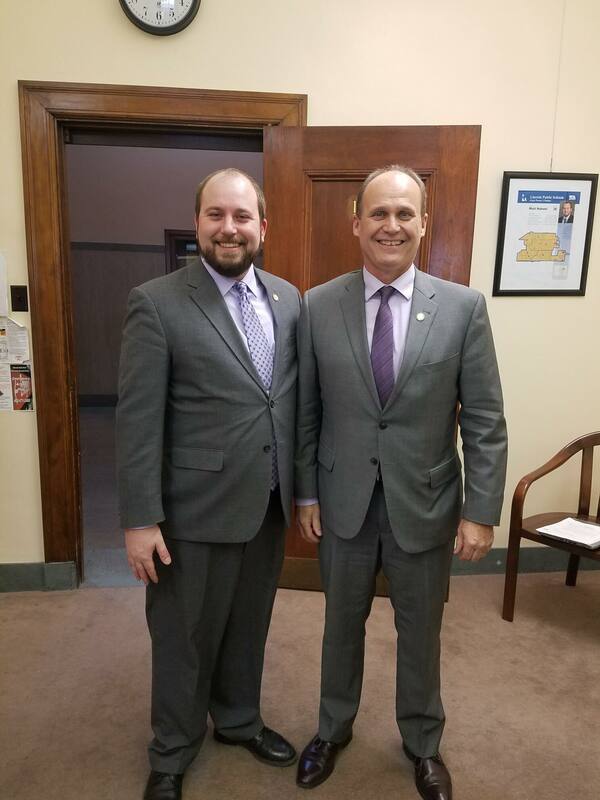 My colleague, Senator Dan Quick from Grand Island, and I happened to accidentally coordinate our outfits. Due to the record number of bills heard in the Judiciary Committee this year, we scheduled a rare recess day hearing and heard nine bills. 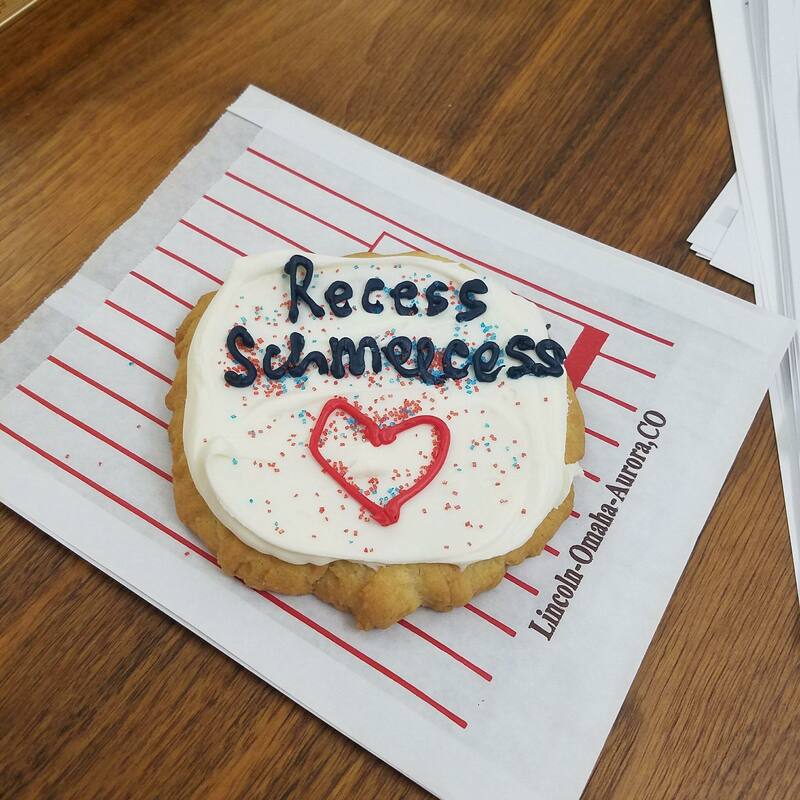 My colleague from Lincoln, Senator Patty Pansing Brooks, brought us cookies to celebrate. The Second Session of the 105th Legislature officially began on January 4th. My office hit the ground running, working on bills from last session that were held over, and introducing 12 new bills in the first 10 days of session. Four of the bills I introduced this session have already had hearings, with the rest scheduled for February. In this newsletter, I’ve updated the status of bills carried over from the 2017 session, briefly explained the 12 bills I introduced this year, and introduced the newest member of our office. 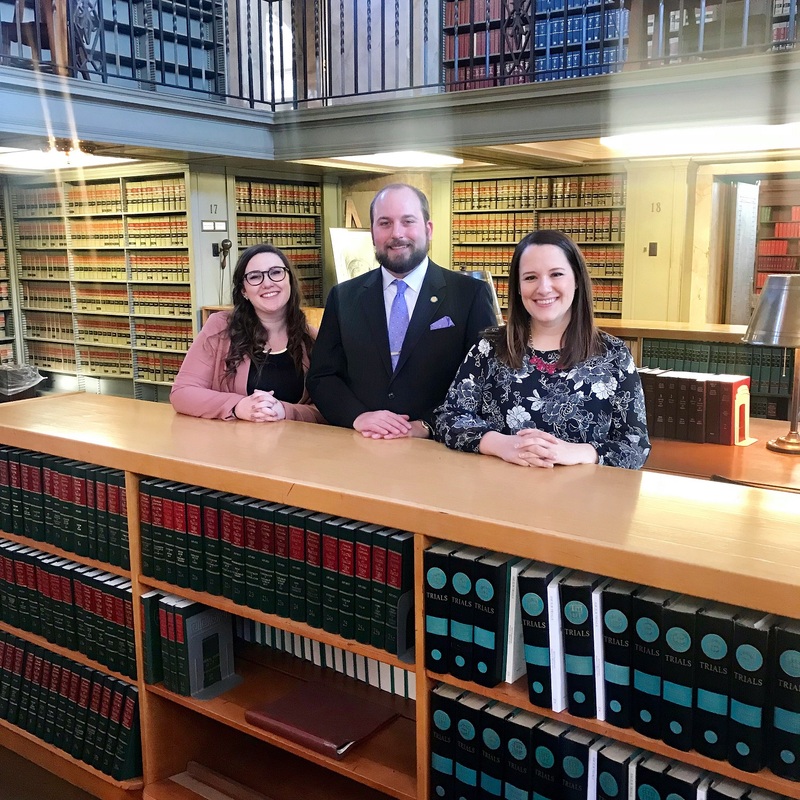 The first day of session always has a bit of a “back to school” feel to it, so in that spirit, my staff and I took a first day photo in the library here at the State Capitol. My staff is always available to assist you, and all three of us are excited to be back serving the citizens of District 26. From left to right, Sarah Wagelie, my administrative assistant; myself; and Courtney Lyons, my legislative aide. Just like last session, I serve on the Business & Labor Committee, the Urban Affairs Committee, and the Judiciary Committee. New this year, if you plan to submit written testimony for a hearing on a legislative bill, committees require it by 5pm the day before the hearing (or 5pm on Friday for Monday hearings). My staff would be happy to assist you with testifying on a bill or submitting written testimony. The Judiciary Committee has a record number of bills to hear this session at 102. Legislative bills that are not passed or indefinitely postponed in long session years are still available to be debated in a short session, but any bills not acted upon at the end of this session are considered dead. LB93, which would adopt the Automatic License Plate Reader Privacy Act, advanced to the third round of debate this month. Each bill gets three rounds of debate, so I’m very excited that LB93 has advanced to Final Reading, the third round. LB93 would protect citizens privacy by implementing best practices on ALPR databases. You can find more information on the bill in the Unicameral Update, here. LB146, which would provide for set-asides of convictions for infractions, passed the first and second rounds of debate this month, and is now on to Final Reading, the third round. LB211, a bill which would raise the minimum wage for tipped workers, is on General File, the first round of debate. It is on the agenda, and hopefully will be debated this week. LB258 passed the first round of debate this month, and is now on Select File (the second round of debate). It would give people being released from Corrections access to state IDs earlier and quicker. 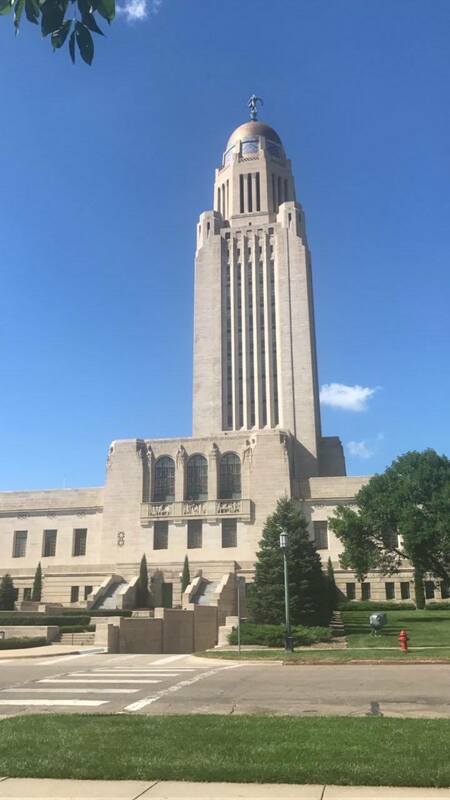 LB258 builds upon a Department of Corrections pilot program started here in Lincoln after the bill was introduced last session. I appreciate all of the hard work from the Department of Corrections and the DMV on the pilot program, and for working with me on LB258. LB748 updates several statutes related to city population. It is a follow-up to LB113, which passed last year, and is intended as cleanup work before the 2020 census. LB748 was first heard in the Urban Affairs Committee on January 16th. LB858 adjusts Workers Compensation disability payments for inflation. LB859 provides information to families of public employees who are killed on the job. This is intended to be much like the information families of private employees receive from the Occupational Safety and Health Administration. LB859 was heard by the Government, Military and Veterans Affairs Committee on January 18th. It was a great hearing with lots of powerful testimony from families who had lost a loved one and would be helped by the bill. LB880 would ask cities to include early childhood education in their comprehensive plans. Those plans already include things such as schools, housing, and employment. This is important planning to help support our families and children. 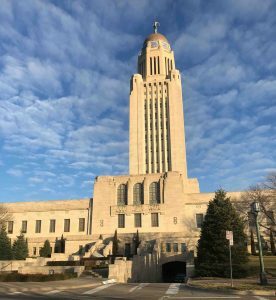 The Unicameral Update posted an article about LB880, and the Holland Children’s Movement has more information, as well as a fact sheet, available here. LB880 was heard by the Urban Affairs Committee on January 23rd. LB916 would prohibit retaliation under the Nebraska Wage Payment Collection Act and the Wage and Hour Act. This means employers wouldn’t be able to punish employees for acts such as filing a complaint that they are not being paid minimum wage, providing regular paychecks, or paying owed wages after you leave employment. LB930 clarifies parents’ and their children’s rights when a child is questioned by law enforcement. It requires that a parent or guardian be present and that the child and parent/guardian waive their right to an attorney before being interrogated. LB954 would give a tax credit to renters, as we often overlook people who rent their homes and apartments in our tax debates. LB986 would create Neighborhood Improvement Districts. This would provide a set of tools for neighborhoods to come together to solve issues together. LB986 is modeled on the successful Business Improvement DIstricts we allow for commercial property. I had the opportunity to talk with Fox42 News about LB986, and you can find the story here. LB1010 is an attempt to speed up and improve access to mental health care in the county jail. It would allow some who have been found incompetent to stand trial to get treatment at an outpatient provider rather than having to wait for treatment behind bars. 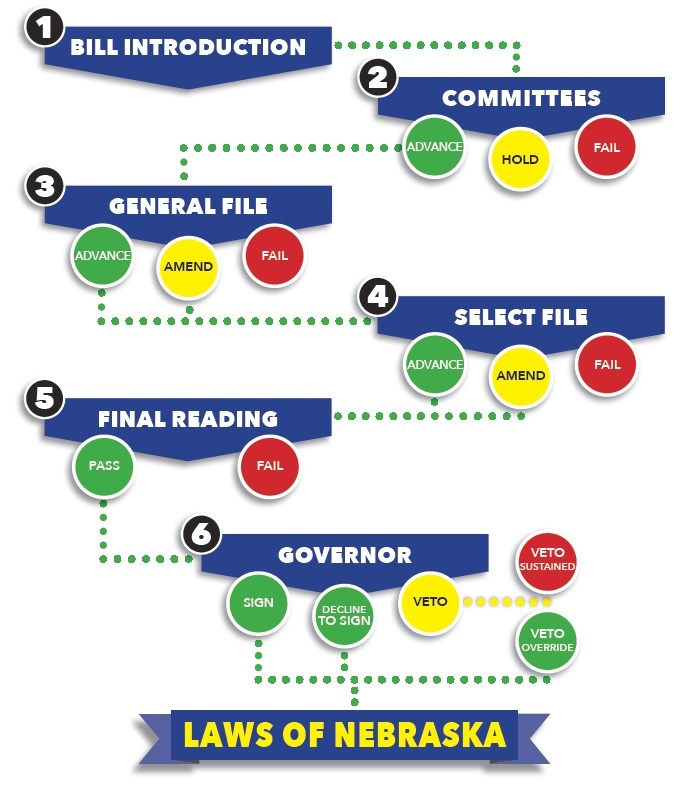 LB1029 is a cleanup of our Uniform Power of Attorney Act, which was suggested by the Nebraska State Bar Association. LB1056 would provide for collection of data from schools on student disciplinary actions, including the number of suspensions, expulsions, and arrests in order to better examine the school-to-prison pipeline. LB1083 would provide for discovery of telephone numbers and email addresses of witnesses in criminal cases. Last December, I hired a new Legislative Aide. Courtney Lyons started just before session at the end of last year. Courtney comes to us from Nebraska Appleseed, and prior to that was the Urban Affairs Committee Clerk. 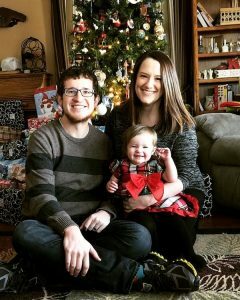 Courtney’s experience in the building and nonprofit experience makes her an excellent addition to our office, and we’re excited to have her on board. Her job tasks her primarily with working upon the legislation introduced by my office. Courtney lives in Lincoln with her husband, daughter, and two dogs. As the interim, and the year 2017, draws to a close, my staff and I have been looking forward to the new year and a new session. Over the interim, I’ve been busy with meetings on a variety of topics, including bills I’ve been working on and plan to introduce next session. I’ve also attended interim hearings for two of the committees I work on, as well as Planning Committee meetings. Additionally, I’ve had a chance to meet with constituents and attend events in the District. I hope this newsletter finds you well, and offer my best wishes for a happy and healthy holiday season and New Year. 2018 will bring a new session of the 105th Legislature, and with it, new opportunities and challenges. Next session, I plan to introduce and continue to support legislation which will reduce overcrowding in our prison system while keeping our communities safe. I will continue to support legislation that empowers our students of all backgrounds and abilities to reach their full potential, and advocate for better wages for our working families. I also plan to introduce legislation that will empower our local neighborhoods and communities. Finally, I’m looking forward to working with my colleagues in the Legislature to balance our state budget while preserving resources for our most vulnerable citizens. I will continue to update you on these topics throughout session via my monthly e-newsletter and my Facebook page, and I hope you will keep in touch. This year’s official state Christmas tree, a twenty year old 24-foot spruce, was donated by Vickie and Roger Lansman of Lincoln. As the second session of the 105th Legislature is fast approaching, I wanted to provide context on what to expect. Each biennium (or two year cycle), the Legislature holds two sessions. The current biennium began in January 2017. The first session of the biennium is a “long” session, or a 90-day session. It usually lasts from the beginning of January through early June, though we recessed early in May this year. The second session is a “short”, or 60-day session. It is scheduled to begin on January 3rd, 2018, and conclude on April 18th. In both sessions, the first ten days are reserved for introducing bills. 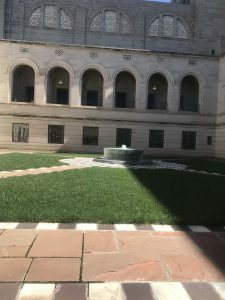 Bills can only be introduced during the first ten days of session, and then will be referenced to the committee which holds jurisdiction over the topic the bill covers. Once a bill is in committee, it has a public hearing, and is voted on by the senators on the committee after the hearing. Each bill introduced has a public hearing in a committee, where anyone can come to share their thoughts. This is unique to Nebraska, and truly allows the citizens of our state to act as the “second house” of the Legislature. During this time, the Legislature will convene in the morning to debate bills, and hold hearings in the afternoon. After all bills have received a public hearing, the Legislature will meet all day to debate and pass legislation until the end of the session. If a bill makes it out of the committee, it is placed onto general file. During the general file stage, senators consider amendments proposed both by committees and individual senators. A majority vote of the Legislature, or 25 votes, is needed to move a bill from general file to the next stage of debate, called select file. Select file is the second debating and voting stage where additional amendments can be added and voted upon. 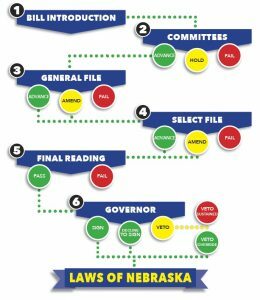 Once a bill is approved on select file, it moves to final reading, where it cannot be amended further, and is constitutionally required to be read aloud in its entirety by the Clerk of the Legislature. A proposed constitutional amendment requires a three-fifths vote of the elected members (30) to place it on the general election ballot and a four-fifths vote (40) to place it on a primary or special election ballot. A bill with an emergency clause requires a vote of two-thirds (33 members) of the Legislature. All other bills without an emergency clause require a simple majority vote before going to the governor. After the Legislature passes a bill on final reading, it goes to the governor for consideration. The governor has five days, not including Sundays, to decide what to do with a bill. If the governor signs a bill or declines to act on it, the bill becomes a state law. The governor may veto a bill, and he has the authority to strike specific budget appropriations (line-item veto). The Legislature may override any gubernatorial veto, although it takes a vote of 30 senators to do so. 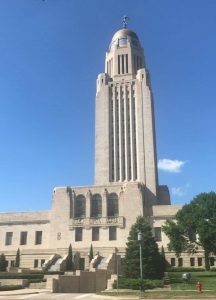 If you have any questions about a bill’s status, the Nebraska Legislature’s website, http://nebraskalegislature.gov, is a great resource. If you need assistance navigating the website, my office would be happy to help. I’m excited to hit the ground running in January! As the interim draws to a close, my staff and I have been looking forward to the new year and a new session. Over the interim, I’ve been busy with meetings on a variety of topics, including bills I’ve been working on and plan to introduce next session. I’ve also attended interim hearings for two of the committees I sit on, as well as Planning Committee meetings. I’ve had a chance to meet with constituents and attend events in the District, as well. I hope this newsletter finds you well, and provides a helpful update on some of the things I’ve been up to over the interim. As the second session of the 105th Legislature is fast approaching, I wanted to provide context on what to expect. Each biennium, the Legislature holds two sessions. The current biennium began in January 2017, at the beginning of this year. The first session of the biennium is a “long” session, or a 90-day session. It usually lasts from the beginning of January through early June, though we recessed early in May this year. The second session is a “short”, or 60-day session. It is scheduled to begin on January 3rd, 2018, and conclude on April 18th. In both sessions, the first ten days are reserved for introducing bills. Bills can only be introduced during the first ten days of session. After that, each bill that is introduced will have a public hearing in the committee it is referred to. During this time, the Legislature will convene in the morning to debate bills, and hold hearings in the afternoon. After all bills have received a public hearing, the Legislature will meet all day to debate and pass legislation until the end of the session. 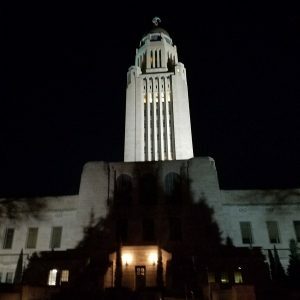 If you have any questions about a bill’s status, the Nebraska Legislature’s website, http://nebraskalegislature.gov, is an excellent resource. If you need assistance navigating the website, my office would be happy to help. I’m excited to hit the ground running in January! Each year, prior to session, all 49 senators gather for a meeting of the Legislative Council. The Legislative Council examines information relating to state government and the general welfare of the state and recommends legislation. During this Legislative Council meeting, which was held here in Lincoln, we had the opportunity to hear from all of the committee chairs about their interim studies, and from chairs of special committees about their findings. This meeting was not only a great opportunity to delve into research and issues we’ll interact with during the session, but a chance to mingle and bond with our fellow senators, some of whom we may not have seen since session ended. I’m appreciative of all who worked to bring this event to fruition, and to my colleagues for sharing their time and expertise. The Urban Affairs Committee, which I vice-chair, held hearings across the state over the interim. The committee decided to conduct a series of interim hearings across the state to hear from different communities on how they utilize tax-increment financing. Our first hearing was held in North Platte. At this hearing, we heard testimony on legislative resolution (LR) LR 160, which was introduced by Senator Hughes, and LR 60, which was introduced by the Urban Affairs committee. LR 160 studied the ability of municipalities in Nebraska to offer relocation incentives to attract new residents. LR 60 studied issues related to the use of tax-increment financing. 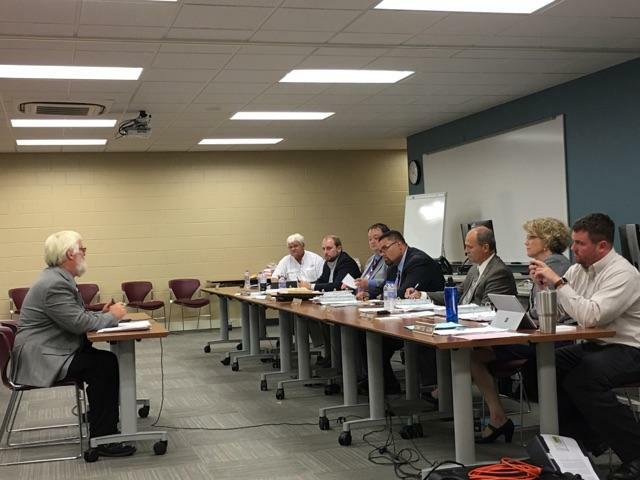 Next, the committee held a hearing in Grand Island, to hear testimony on LR 60 and LR 138. LR 138 was introduced by Senator Crawford and examined the tools, mechanisms, and funding sources available to municipalities to provide for condemnation or demolition of vacant and abandoned buildings. We heard additional testimony on LR 60, the tax-increment financing study introduced by the committee. In October, the committee held its final hearing of the interim. We heard testimony on LB81, introduced by Senator Wayne, which examined the adoption and enforcement of state fire codes. We also continued to hear testimony on our committee resolution, LR 60. I’m very appreciative of all those who came out to testify in North Platte, Grand Island, and Lincoln. This interim, the Judiciary Committee held two interim hearings, one in September, and one in October. In September, we heard testimony on four legislative resolutions: LR 114, LR 191, LR 198, and my LR 221. 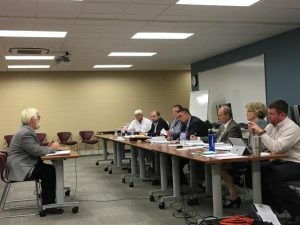 LR 114 was introduced by the Judiciary Committee to examine Nebraska’s statutes relating to geriatric or compassionate release laws for elderly inmates. LR 191 was introduced by Senator Ebke, and studied possible legislative reforms to Nebraska’s mandatory minimum sentencing laws. LR 198 was introduced by Senator Pansing Brooks and studied the impact of incarceration on children in Nebraska. Finally, I introduced LR 221 to examine possible reforms to Nebraska’s sentencing laws to accommodate an option of deferred judgment probation. In October, the Judiciary Committee held a hearing on LR 172 and LR 173, both of which were introduced by Senator Wishart. LR 172 reviews recruitment and retention efforts that are currently or could possibly be undertaken by the Department of Correctional Services, and LR 173 reviews the work detail and work release efforts at the community corrections centers. I greatly appreciate all who came out to share their knowledge on these important issues. Thanks to everyone who has called, sent letters, e-mailed, or stopped by our office to share your views! We hope you’ll continue to let us know what is important to you. If you have any questions or concerns, please call us at (402) 471-2610 or email us at mhansen@leg.ne.gov. We look forward to hearing from you! As always, thanks for reading. This last month has been full of meetings and research as my staff and I work through the interim on issues and studies for next year’s session. Several committees I serve on have been busy holding hearings on interim studies, which I’ve detailed below. 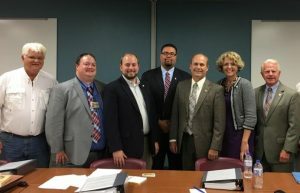 The Urban Affairs committee had the opportunity to travel out to Grand Island for a hearing late last month. We heard testimony on two legislative resolutions, LR 138 and LR 60. LR 60 was introduced by Senator Crawford and examines the tools, mechanisms, and funding sources available to municipalities to provide for condemnation or demolition of vacant and abandoned buildings. LR 60 was introduced by the Urban Affairs committee, and studied issues related to the use of tax-increment financing. We have been conducting a series of interim hearings across the state to hear from different communities on how they utilize tax-increment financing (TIF). I’m appreciative of all those who came out to share their knowledge on the matter, and to Grand Island for hosting us. This month, we had also an Urban Affairs hearing here in Lincoln, at the State Capitol. to hear testimony on our committee resolution, LR 60, examining tax-increment financing. testimony on two interim studies, LR 172 and LR 173, both introduced by Senator Wishart. LR 172 reviews recruitment and retention efforts that are currently or could possibly be undertaken by the Department of Correctional Services, and LR 173 reviews the work detail and work release efforts at the community corrections centers. I greatly appreciate all who came out to share their knowledge on these important issues. One of the committees I sit on is the Legislature’s Planning Committee. We have had several opportunities to meet during the interim, all of which have been very informative. The Planning Committee is designed to identify and plan for long-term challenges in the state. Specifically, the chair of the committee, Senator Schumacher, is focusing on the increasing retirement age population, and the comparison of urban and rural population trends. During this month’s meeting, the director of Nebraska’s new Department of Transportation briefed the committee on the next several years of roads and infrastructure projects in the state. 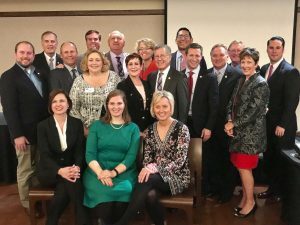 Alongside many of my legislative colleagues, pictured above, I was honored by the Holland Children’s Movement at their Holland Honor Roll Awards for standing up for children and working families in the Legislature. This last month has been full of meetings and research as my staff and I work through the interim on issues and studies for next year’s session. Several committees I serve on have been busy holding hearings on interim studies, which I’ve detailed below. I hope this newsletter finds you well, and provides a helpful update on some of the things I have been up to during the interim. The Urban Affairs committee, of which I am vice-chair, had the opportunity to travel out to North Platte for a hearing last month. We heard testimony on two legislative resolutions, LR 160 and LR 60. LR 160 was introduced by Senator Hughes and studied the ability of municipalities in Nebraska to offer relocation incentives to attract new residents. LR 60 was introduced by the Urban Affairs committee, and studied issues related to the use of tax-increment financing. We are conducting a series of interim hearings across the state to hear from different communities on how they utilize tax-increment financing. I’m appreciative of all those who came out to share their knowledge on these matters, and to North Platte for hosting us. State senators and staff present at the Urban Affairs hearing. From left, Senator Groene, Urban Affairs Committee legal council, myself, Senator Wayne, Senator Quick, Senator Crawford, and Senator Williams. Listening to testimony at the Urban Affairs hearing in North Platte. Images courtesy of League of Nebraska Municipalities. This month, the Judiciary Committee held its first interim hearing. We heard testimony on four legislative resolutions: LR 114, LR 191, LR 198, and my LR 221. 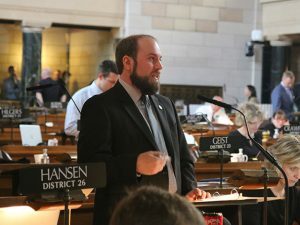 LR 114 was introduced by the Judiciary Committee to examine Nebraska’s statutes relating to geriatric or compassionate release laws for elderly inmates. LR 191 was introduced by Senator Ebke, and studied possible legislative reforms to Nebraska’s mandatory minimum sentencing laws. LR 198 was introduced by Senator Pansing Brooks and studied the impact of incarceration on children in Nebraska. 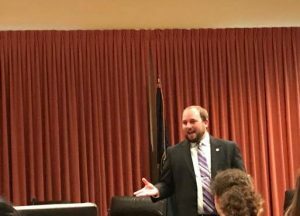 Finally, I introduced LR 221 to examine possible reforms to Nebraska’s sentencing laws to accommodate an option of deferred judgment probation. The hearing was full of excellent information about all of these important topics, and I am appreciative of everyone who came out to share their thoughts. I introduced legislative resolution 221 to examine possible reforms to Nebraska’s sentencing laws to accommodate an option of deferred judgment probation. Deferred judgment probation can take many forms, but is typically a type of probation that allows for the individual to be sentenced to probation, and come back before a judge after completing the requirements to then set-aside, or dismiss, that conviction. This practice is currently in law in a majority of states, and is often seen as a positive option for both the prosecution and defense. I introduced this legislative resolution to further study the availability of deferred judgment probation for first-time offenders and for non-violent crimes, without replacing regular probation for more serious offenses and subsequent offenses. This concept of deferred judgment probation is consistent with other components of our justice system that the Judiciary Committee has considered, such as expungement and support of problem-solving courts, such like the drug courts, veterans’ courts, and mental health courts which have shown success here in Nebraska. I appreciate all of the testimony heard on this legislative resolution, and I hope that deferred judgment probation and other alternatives to incarceration will continue to be part of the conversation. 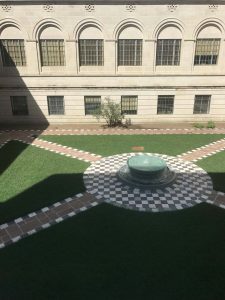 This month, we continued to celebrate Nebraska’s 150 years of statehood by dedicating the courtyard fountains at the Capitol. My office has a wonderful view of one of the fountains, and my staff and I are pleased to see all of the hard work over the last year pay off. These last few weeks of summer have been full of meetings, research, and travel. I have been fortunate enough to spend some extra time with my family, as well. My staff and I have been hard at work on our interim studies, and we are gearing up for interim hearings in several of the committees on which I serve. 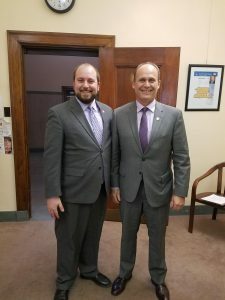 I hope this newsletter finds you well, and provides a helpful update on some of the things I have been up to since session ended in May. 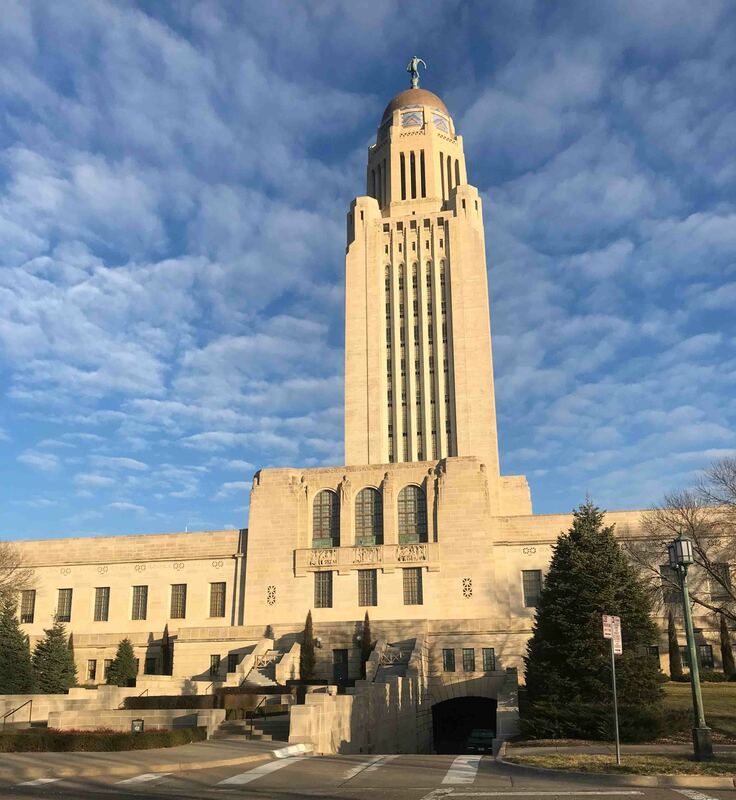 The Nebraska Legislature is a part of the National Conference of State Legislatures (NCSL), a collection of legislative members and staff from across the country. 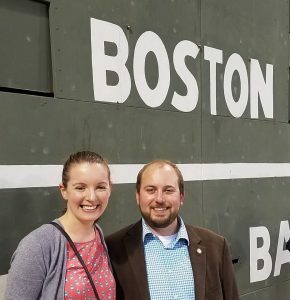 I attended this year’s NCSL annual summit in Boston in early August with several other senators and staffers from Nebraska. NCSL works hard to provide research and learning opportunities for the states, and I appreciated the opportunity to attend sessions ranging from an overview of recent Supreme Court decisions, to bail reform, to proactive community solutions for drug addiction. My wife, Jane, and me in Boston. 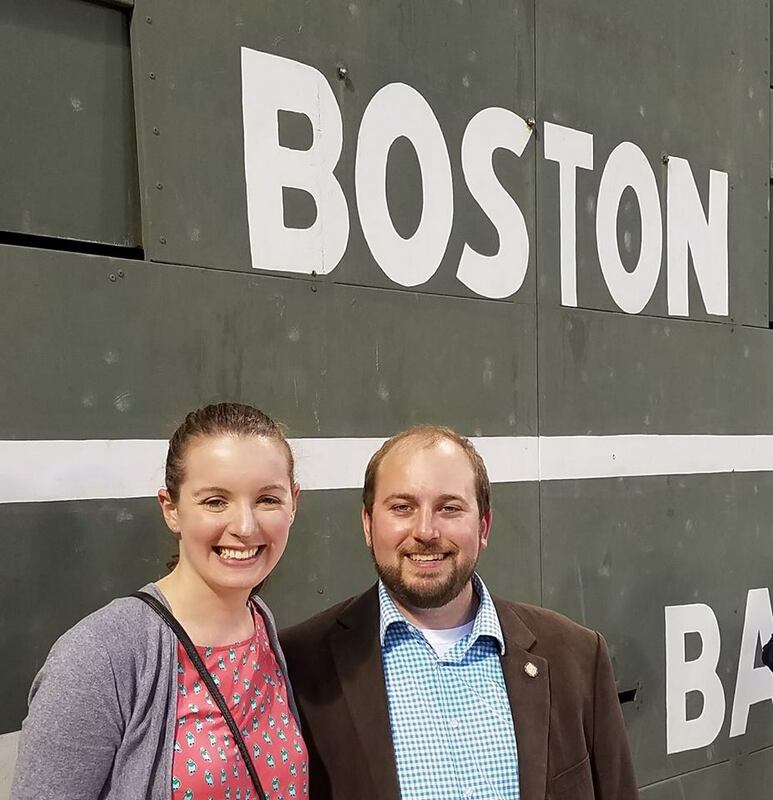 I had the opportunity to meet with other elected officials and national leaders last month for the Young Elected Officials (YEO) network annual convening. At the convening, we explored policy initiatives, participated in issue-based training sessions, and shared best practices from our states. 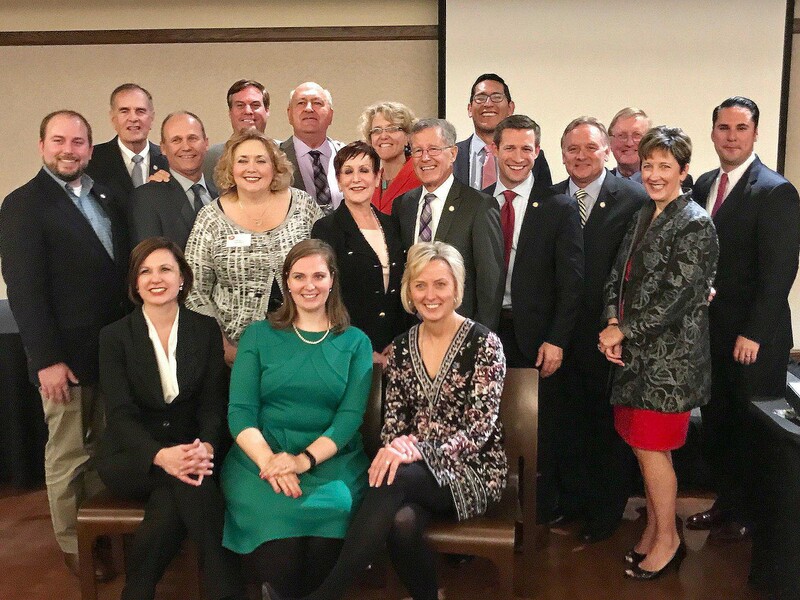 I particularly enjoyed that the convening involved elected leaders from all levels of local government. Hearing from and working with mayors, city council-members, school board members, and other elected officials gives a unique perspective on how different policies discussed in trainings are implemented and impact local communities. In the interim, I have had the opportunity to meet several times with the Legislature’s Planning Committee. This month’s meeting focused on long-term budgetary issues arising from population trends and historical issues. We had several excellent presentations, including researchers at the University of Nebraska-Omaha, focusing on long term planning scenarios for the state. The Planning Committee is designed to identify and plan for long-term challenges in the state. The Nebraska Legislature is seeking pages for the upcoming legislative session in January. 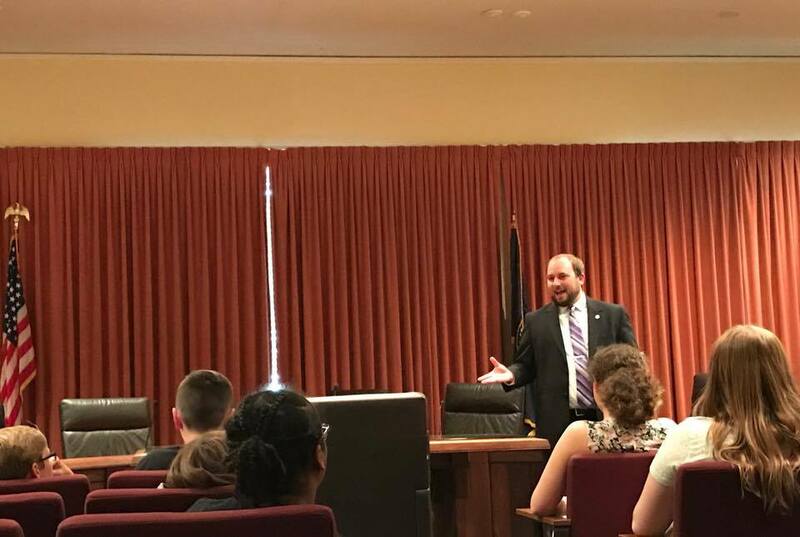 Pages get the opportunity to observe the lawmaking process, see debate first-hand and meet Nebraska’s state senators. Pages must be high school graduates who are currently enrolled in a Nebraska college or trade school. This is a paid position, and pages may be able to receive credit hours from their university or college. The application deadline is September 29th, and applicants are encouraged to contact their home district state senator for a letter of recommendation. For more information, contact my office at (402) 471-2610 or the Clerk of the Legislature at (402) 471-2271. Applications are available via my office, or the Clerk of the Legislature’s office. My staff would be happy to assist anyone looking to apply. The first session of the 105th Legislature adjourned early, on May 23rd. The session was scheduled to adjourn on June 2nd, but due in large part to having heard all of the priority bills and finalizing the budget, Speaker Scheer announced we would adjourn early. The interim has now begun, and we are keeping busy attending meetings, traveling, and preparing for interim studies. In this newsletter, I’ve recapped the bills my office passed this session and the interim studies we introduced and will be working on. This session, the following bills that I introduced were passed: LB113, LB259, and LB519. The contents of my bill LB145 were amended into LB259, bringing the grand total up to four bills passed during the first session of the 105th Legislature. My priority bill, LB259, was advanced to the Governor’s Desk on May 8th, and approved by the Governor on May 12th. LB259 aims to eliminate unnecessary financial burdens on our counties by allowing individuals who are sitting in jail in order to pay off debts the opportunity to pay via an installment plan or perform community service. Often, people who commit a crime that carries no jail time are sentenced to pay a fine and court costs. When they are unable to pay this fine, they “sit out” the fine in jail, and are credited $90 a day. This creates a burden on the jail and the county, as they end up losing money. I introduced LB259 in order to rectify this expensive public policy, and I am grateful to my colleagues for their support on this issue. Portions of my bill, LB145, were amended into LB259. LB113 was designed to change population threshold provisions relating to municipalities and eliminate obsolete provisions. The bill updated statutes that reference city population thresholds and adds clarifying language. LB113 was the result of the findings of LR526, an interim study conducted by the Urban Affairs Committee during the 2016 interim, and was supported by the League of Municipalities and the City of Lincoln. It was signed by the Governor on March 29th. My bill, LB519, was placed on the consent calendar this year. Consent calendar is a term for a portion of our legislative agenda that is set by the Speaker, and includes non-controversial legislation. The idea behind the consent calendar is to pass consensus bills which do not need much debate more efficiently. I introduced LB519 in order to treat government employers the same way as private employers in regards to paying the unemployment benefits of a newly hired employee. I am very glad this legislation was included on the consent calendar agenda, and appreciate my fellow senators’ votes on LB519. LB519 was approved by the Governor on May 22nd. My staff and I have selected a few issues to study more in depth over the interim in order to inform our legislative proposals for the upcoming session. To that end, I have introduced LR219, LR220, and LR221. LR219 is an interim study to examine the effectiveness of the Nebraska state statute that relates to the imposition of bail, and the relevant statutes which relate to the imposition of fines, fees, and court costs. Our hope is that an interim study will help us propose legislation to enhance the effectiveness of these programs. LR220 is an interim study to investigate the purpose and benefits of creating conviction integrity units in Nebraska. Conviction integrity units, or CIUs, are divisions which work to prevent, identify, and correct false convictions. Finally, LR221 is an interim study to examine possible reforms to Nebraska’s sentencing laws to accommodate an option of deferred judgment probation. 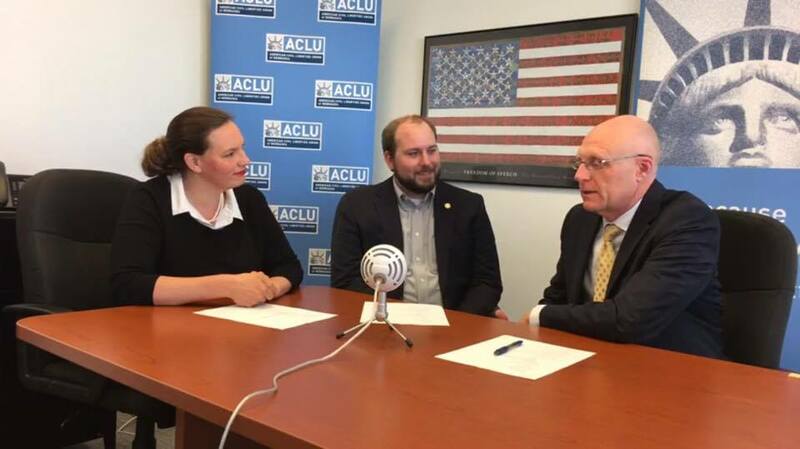 Last month, I had the opportunity to visit the ACLU of Nebraska and chat with Executive Director Danielle Conrad and lobbyist Spike Eickholt. We talked about the legislative session, namely, good legislation that was passed, legislation that was stopped, and our goals, separately and collectively, for the next legislative session. 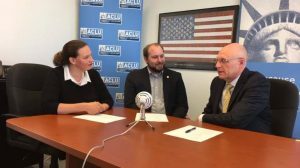 The entire Facebook live conversation can be viewed on their Facebook page, ACLU of Nebraska, here. I’m appreciative of the opportunity to discuss important policy with the ACLU, and thank them for their invitation. The first session of the 105th Legislature was scheduled to adjourn sine die on June 2nd. To adjourn ‘sine die’ means to adjourn without setting a future date for reconvening, finishing the legislative session for the year. However, Speaker Scheer announced that we would adjourn early, on May 23rd. During this long session year, we are constitutionally required to accomplish our session in no more than 90 days, but it is up to the discretion of the speaker to schedule our agenda within those 90 days. Speaker Scheer announced that we would adjourn sine die early, in large part due to having heard all of the priority bills and finalizing the budget. Over the last few weeks, the Legislature was busy passing bills and holding a few final committee hearings to approve appointments and pass legislative resolutions. This month, the legislature also voted to advance the budget bills to the Governor’s desk. It has been a long process balancing the budget while experiencing a budget deficit. I am grateful for all of the hard work of my colleagues on the Appropriations Committee to bring us a balanced budget, and the work of my fellow senators on the bills once they were on the floor. My priority bill, LB259, was advanced to the Governor’s desk on May 8th, and approved by the Governor on May 12th. LB259 aims to eliminate unnecessary financial burdens on our counties by allowing individuals who are sitting in jail in order to pay off debts the opportunity to pay via an installment plan or perform community service. Often, people who commit a crime that carries no jail time are sentenced to pay a fine and court costs. When they are unable to pay this fine, they “sit out” the fine in jail, and are credited $90 a day. This creates a burden on the jail and the county, as they end up losing money. I introduced LB259 in order to rectify this expensive public policy, and I am grateful to my colleagues for their support on this issue. Speaking on LB259 in April. 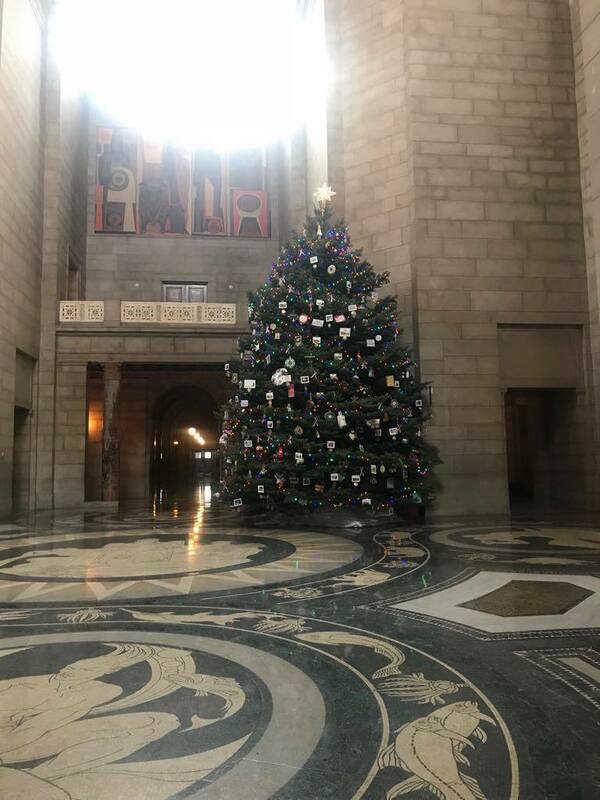 Photo courtesy of Unicameral Update. My bill, LB519, was placed on the consent calendar this year. Consent calendar is a term for a portion of our legislative agenda that is set by the Speaker, and includes generally non-controversial legislation. The idea behind the consent calendar is to pass consensus bills which do not need much debate more efficiently. I introduced LB519 in order to treat government employers the same way as private employers in regards to paying the unemployment benefits of a newly hired employee. I am very glad this legislation was included on the consent calendar agenda, and appreciate my fellow senators’ votes on LB519. LB519 was delivered to the Governor’s desk on May 16th. My staff and I have selected a few issues to study in more depth over the interim, in order to inform our legislative proposals for the next session. To that end, I have introduced three legislative resolutions, LR219, LR220, and LR221. LR219 is an interim study to examine the effectiveness of the Nebraska state statute that relates to the imposition of bail, and the relevant statutes which relate to the imposition of fines, fees, and court costs. Our hope is that an interim study will help us propose legislation to enhance the effectiveness of these programs. LR220 is an interim study to investigate the purpose and benefits of creating conviction integrity units in Nebraska. Conviction integrity units, or CIUs, are divisions which work to prevent, identify, and correct false convictions. 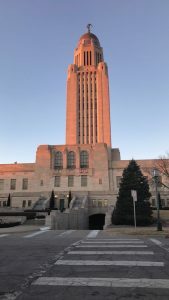 Finally, LR221 is an interim study to examine possible reforms to Nebraska’s sentencing laws to accommodate an option of deferred judgment probation. In May, I had the pleasure of speaking to several groups of students. First, I visited with the Dawes Middle School Student Council while they were at the Capitol as part of their Capitol Experience Day. They had several impressive questions for me, and I was happy to have a dialogue with them about important issues facing our state. I also had a chance to visit with fourth and fifth grade students at Faith Lutheran Elementary School on one of our recess days. Finally, this month I also had the opportunity to visit a Culler Middle School classroom. I am appreciative of these schools for inviting me to speak with their classrooms, and I enjoyed visiting with these students. Speaking with students from Dawes Middle School at the Capitol.